A juvenile penitentiary drama, Bad Boys is an uncompromising look at youth gone bad. A young Sean Penn supported by a dedicated cast ensures a compelling experience. In Chicago, teenager Mick O'Brien (Penn) already has a long record of increasingly violent crimes. 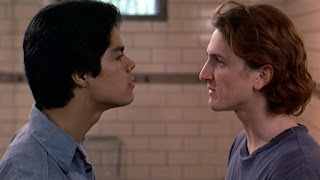 His girlfriend J.C. (Ally Sheedy) is sure that he will soon cross the line and end up incarcerated. Paco (Esai Morales) is another teenager getting involved in the drug trade, and his young Hispanic gang runs afoul of another local group of black thugs. A wild three-way street shoot-out at midnight ends with several dead bodies, and Paco's young brother is killed by Mick's out-of-control car as he tries to flee the police. Mick is arrested and sentenced to Rainford Juvenile Correctional Facility. Paco vows revenge. At Rainford, counsellor Ramon Herrera (Reni Santoni) tries to help Mick change his ways. But Mick is preoccupied with survival within the jungle laws of the facility. He establishes a friendship of sorts with his cellmate Horowitz (Eric Gurry), an impish smartaleck who thrives by outsmarting the goons. 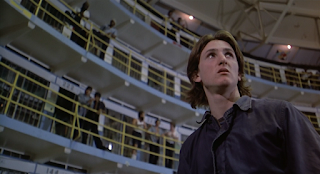 The cellblock is run by a hierarchy of prisoners, and at their head are the brutal duo of Viking (Clancy Brown) and Tweety (Robert Lee Rush). As bad as things are for Mick, they are about to get a lot worse, with an enraged Paco targeting J.C. as part of his plan to avenge his brother's death. Directed with notable fluidity by Rick Rosenthal, Bad Boys embraces many of the clichés expected in prison dramas, but then polishes them to a new shine. Helped enormously by the charismatic Penn and a supporting young cast fully immersed into their roles, Rosenthal does not glamourize the male-dominated violence that rules the detention centre. Rather, Bad Boys presents a jungle behind fences that serves to worsen the lives of kids already caught up in the jungle of the streets. Incarceration simply confirms that violence and cruelty are what is needed to survive. This is not an easy film to watch. There are no intervals of humour or any form of relief, and the uncut version offers up 123 minutes of ever increasing agony. In the opening 30 minutes Rosenthal effectively sketches in the sorry lives of Mick and Paco, setting up the rest of the drama to unfold mainly within the grim walls of the juvenile detention centre. As Mick struggles to adapt to the new power dynamics now governing his life, the brief interludes back on the outside are just as disturbing: the decline of Paco's revenge-driven life accelerates, with J.C. on the receiving end of his rage. Bad Boys is true to its title and set in the world of boys who may never have a chance to become men. There are a few adults in the film, but they are almost irrelevant. The mothers of Mick and Paco have already made all the key mistakes and are now ineffective or uninterested in their sons' lives. The men who run the detention centre talk tough but are next to useless. The animals run this zoo, and ironically it is often the zookeepers who are hiding in cages. Rosenthal succeeds in giving many of the prisoners distinct personalities, with Horowitz emerging as a memorable nerd with a mean streak, while Viking is the sort of brute who will go only as far as his outsized muscles will take him, given the scarcity of any smarts. The detention centre is also filled with the expected assortment of rapists, black market traders, and victims. Sean Penn, at around 22 years old when Bad Boys was filmed, gives the film its heart and soul. Mick is standing on the crossroads of where life can take him, and at its core this is the story of a young man getting a close-up view of the hell that awaits him down the path that he has so far chosen. Penn gives Mick a sorrowful humanity that strongly hints at the salvation that may lie within. Mick's one advantage is that he has a person who believes in him. J.C. (Ally Sheedy's impressive debut) plays the dual role of the girl who should know better than to hang out with the likes of Mick, while also being his only guiding light to a potentially better future. Bad Boys aches for the youth left behind in society's sewers, and offers only the slightest hope that one out of many can crawl out of the filth.